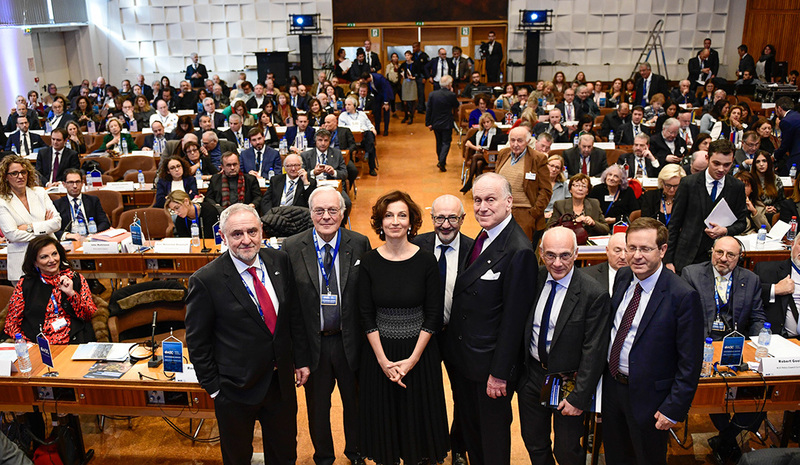 The Governing Board of the WJC, comprising presidents of Jewish communities worldwide, held an unprecedented gathering at the headquarters of the United Nations Educational, Scientific, and Cultural Organization (UNESCO) in Paris in November 2018. During their meeting, the first of its kind at UNESCO, the WJC delegates signed a commitment to the preservation of Holocaust memory and to fighting antisemitism worldwide. WJC CEO Robert Singer praised UNESCO for hosting the gathering, and for its ongoing commitment to the Holocaust memory and education. "The World Jewish Congress, under the leadership of WJC President Ronald S. Lauder, is honored to hold its annual Governing Board meeting at this critical institution, the headquarters of global education, culture, and science. We thank UNESCO for its hospitality and consistent engagement in promoting the preservation of Holocaust memory and education." The delegation was joined by senior representatives of the international community and Israeli organizations, including Jewish Agency Chairman Isaac Herzog. WJC CEO Robert Singer, WJC Governing Board Chairman David de Rothschild, UNESCO Director-General Audrey Azoulay, CRIF President Francis Kalifat, WJC President Ronald S. Lauder, WJC Commissioner for Education and Academia Jean de Gunzburg, and Jewish Agency Chairman Isaac Herzog, with representatives of more than 100 Jewish communities worldwide at the UNESCO headquarters in Paris. (c) Shahar Azran. On the sidelines of the Governing Board meeting, WJC and UNESCO officially launched a joint Holocaust education website, geared at providing students, young adults, and others with essential information about the history of the Holocaust and its legacy. 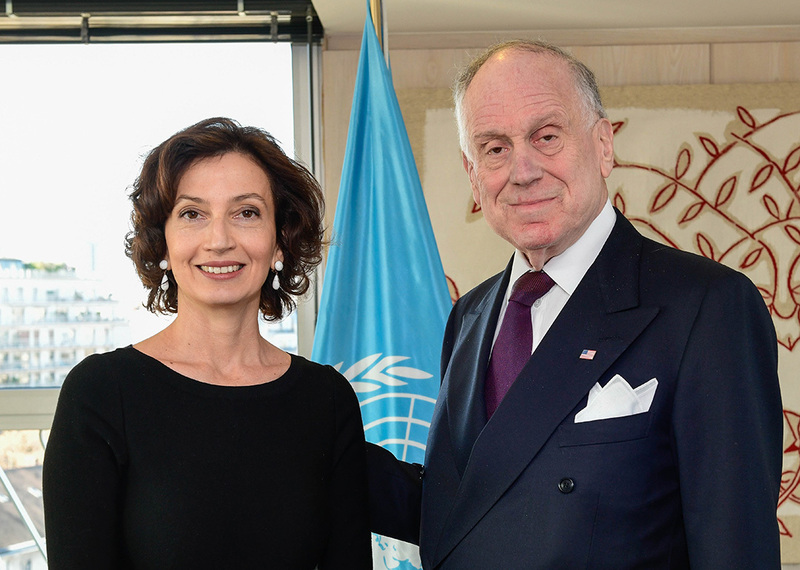 The website was unveiled by WJC President Ronald S. Lauder, UNESCO Director-General Audrey Azoulay, and WJC Commissioner for Education and Academia Jean de Gunzburg at the UN agency’s headquarters in Paris, on the sidelines of the annual WJC Governing Board meeting. “UNESCO is today the primary UN agency leading the efforts in fighting anti-Semitism and advocating for the importance of Holocaust education, and we commend its professional staff under the leadership of Director-General Azoulay, on their steadfast commitment to this critical cause,” Lauder added. The interactive website, aboutholocaust.org, is now available in English and is expected to be launched in dozens of languages, including Chinese and Arabic, going forward. This unique initiative is specifically dedicated to providing frequently asked questions and common misconceptions about the Holocaust, and contains a range of simple content, including must-know facts, video testimonials of survivors, and the latest news updates about Holocaust educational programs and activities. The idea behind this project is to reach out to those with limited knowledge of the Holocaust and make the facts easily accessible and navigable. At the heart of the website is the Teach-A-Friend feature, enabling users to ‘nominate’ a peer to receive automatic emails containing information and facts. Aboutholocaust.org will also guide users to visit the United States Holocaust Memorial Museum's expert website for an in-depth and advanced look at the topics explored. The WJC and UNESCO have enjoyed a close and positive working relationship over the years, including a project currently underway working together on training decision makers to implement guidelines on fighting antisemitism. The launch of aboutholocaust.org marks an important step in the long-term partnership between the WJC and UNESCO on Holocaust education and combating anti-Semitism.